At least 28 are people have been killed in a series of explosions that targeted bars in the northern Nigerian city of Kano, a hospital source tells the BBC. Witnesses said the blasts shook a Christian neighbourhood that has previously been attacked by militants from the Islamist group Boko Haram. The army said 12 people had been killed when explosions placed in packages were dropped in the area on Monday evening. In March, explosions at a bus station in the city killed more than 20 people. Correspondents say the Muslim majority in the city are now anxious about possible reprisals, as people come out onto the streets after breaking their daytime fast during the Muslim holy month of Ramadan. 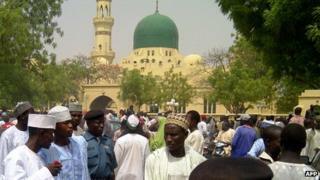 "We have had some explosions in Sabon Gari this evening," Kano state Police Commissioner Musa Daura said. "The explosions happened at open-air beer parlours, where people were playing snooker." Eyewitnesses say multiple blasts struck the predominantly Christian district at around 21:30 local time (20:30 GMT), in an area where people had gathered to enjoy the area's nightlife. "After the first bomb, I threw myself into the canal (drain) to hide. There were at least three blasts,'' resident Kolade Ade told Associated Press news agency. Fruit vendor Chinyere Madu told the AFP news agency she heard four explosions, which "shook the whole area". She said she "saw one person carrying someone on his shoulders with bleeding legs". Nicknamed Boko Haram, a phrase in the local Hausa language meaning, "Western education is forbidden"
The BBC's Yusuf Ibrahim Yakasai in Kano says that the military have cordoned off the blast site, preventing people from entering the area. A hospital worker told our reporter he had counted 28 dead bodies; a further 15 were wounded. However, the military said the explosions left 12 people dead and a "couple of others" injured. The blasts could have been avoided if the public had been vigilant, and had spotted packages containing explosive devises being "dropped" in the area, the military said in a statement. The same neighbourhood has been targeted in the past by the militant Islamist Boko Haram group, which is fighting to create an Islamic state in the mainly Muslim north of Nigeria. The group, whose name means "Western education is forbidden", has increasingly targeted schools and civilians in its attacks. Since the Islamic insurgency started in 2009, more than 2,000 people have died. Though no group officially claimed responsibility for the bus station blasts in Kano earlier this year, Boko Haram was largely blamed for the attack. In May, Nigeria's President Goodluck Jonathan declared a state of emergency and deployed the army to the three states to the east of Kano were the group has been most active - Borno, Yobe and Adamawa.